Sale - a crumpled box. 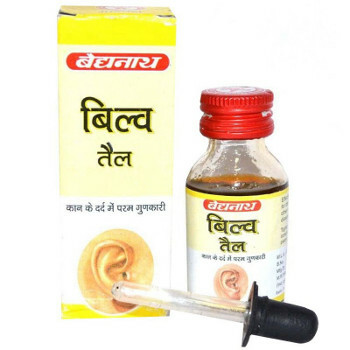 Bilva tail - drop used to treat inflammatory processes in the ears and when hearing impairment. Indications: otitis, tympanic, deafness, tinnitus, age-related hearing loss. Content: Bilva, Peshika, Majth, Amla, Cuminum, Cyperus, Nagkeshar, Netrabala, Ajaksheera, Brassica Juncea, Gomutra. Method of application: the Procedure is recommended before bedtime. Lie on side, drip into the ear of half a pipette of warm oil soak for several minutes in the same position to keep the oil inside the ear, then plug ear with a cotton swab and repeat the procedure with the second ear (if necessary). Go to sleep with cotton balls in my ears. To avoid drafts, hypothermia, dry food. Original name: Baidyanath Bilva tail. In our store You can buy authentic Bila concealed Baidyanath at the best price!